Mississippi Pizza is a great little room in Northeast Portland with a very cozy and casual atmosphere. On this particular eve, we had the bill all to ourselves. As a result, we decided the time was ripe to be a little "extra jammy". Our suspicions were confirmed, and with our mics producing feedback during the opening song, we opted to keep things on the instrumental side for the entire set. 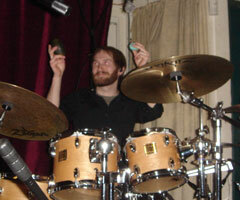 As such, there was an abundance of transition and full jams that cropped up throughout, including the debut of a new drum-based loop piece called "Bamboo" that James brought in to keep us on our toes. We are looking forward to being back at the "Ole' Miss" again in early February.